Eden, only ten years after the events in Mother of Eden but on the opposite side of the great rift in the human society of Eden that occurred in the original book. Mother of Eden described Starlight Brooking’s experiences among the descendants of those who followed John Redlantern. Daughter of Eden follows Starlight’s childhood friend Angie who lives among the Davidfolk, the descendants of those who remained loyal to John’s great enemy, David Redlantern. Angie, who left her original home to be become a shadowspeaker, witnesses two cataclysmic events that will change the course of Eden’s history. More early reviews here from Gareth D Jones in SF Crowsnest, and here on the book blog For Winter Nights. Some thoughts of my own about this book here. Well, I’M excited about it Pat, certainly. I need to read Mother of Eden first – any idea when the paperback version will be released? Can’t see it on Amazon anywhere! Fantastic! I just read the first two and can’t wait for the third. They are captivating captivating stories. I believe it will be out in pbk in April, Kevin. Thanks very much Erik I think you’ll like Daughter of Eden. UK: no date set as yet, but I guess around the middle of this year. US: no publication plans as yet. Pleased to hear you’re enjoying the books so far. There should be an installment set several hundred years into the future, once they have industrialized and developed interstellar space travel! (Seems fair to assume their development would follow an accelerated schedule, given the knowledge they have of what is possible… In your books so far they’ve gone from hunter gatherer to bronze age in 200 years, pretty fast). That was my thinking exactly about the bronze age, Joe: it took so long coming first time round because no one even knew that metal was there to be found. If you know there was such a thing as ore, and were determined enough to find it, it would be a different story. I think Eden would still take a long time to get to space travel though! A 3rd Eden book on its way – can’t wait!! Fantastic books Chris! Whats next? Thanks Alan! A short story collection next I think, original stories, very different from anything I’ve done before. And then a novel set on Earth! Great news, really looking forward to it! So you will be leaving Eden after the third book – or any plans to return? Thanks Pete. No plans to return after D o E, but who knows? I’m really looking forward to this book! The Eden novels totally pulled me into another world in a way very few other books have. Thanks Chris! Thanks Sam. I’m very pleased with the way Daughter of Eden came out, and I hope you enjoy it too. You may have no plans to return after DoE, but you easily could! I doubt I’m alone in wanting to know what Eden looks like several generations on from Starlight’s time – especially among the Tinafolk she ends up with. Well, it’s very nice of you to say you’d like more than 3 books, Siara. Who knows? But the next couple of books I write won’t be set in Eden. I know what you mean about the Tinafolk, but it’s an odd thing, the more likeable and decent a society is, the harder it is to write a decent story about it. (Also I kind of like the idea of living the Tinafolk and their society for everyone to imagine for themselves!) You will hear a bit more about them in Daughter of Eden. Well, who knows, but no plans to return that at present. My next novel will be set on Earth! I’m so pleased that you want more of Eden, though. Even if you’re finally putting Dark Eden and it’s heartfelt journey to rest Mr. Beckett, I do hope to see at least one Easter egg or reference to it in one of your novels down the road! Nonetheless the first two books gives an excellent insight human nature and offers great sociological commentary, even outperforming other novels in it’s field. Sad as I may be, I’m thoroughly excited for the series culmination. Thanks Robert. And no, I don’t rule out some sort of reference to Eden again in the future! Just don’t think there’ll be another Eden novel. Great series, really looking forward to finishing it. Are there plans yet for a US paperback edition? Thanks Erik. I often get asked this but there are no plans for a US paperback as yet. I loved your first two books, they are amazing. Will this book get an audio release? Indeed it will. In fact the recording of it is already underway. Thanks for your kind comments on the other books! I think my previous comment got deleted because of a link. I wanted to share with you an animation I had seen, after showing it to a friend I was told I should read Dark Eden. It was an 80’s Russian animation thats up on youtube (Перевал – Pereval (1988) by Vladimir Tarasov) very similar feel. Could you recommend other media that is similar to Dark Eden? Thanks for this, Alex. I hadn’t come across this before, and certainly there are similar themes: snow, darkness, a mountain pass, a crashed spaceship. Interesting animation too. Other media similar to Dark Eden? Well, when I saw the night scene in the film Avatar, with the glowing vegetation, it certainly reminded me of Eden (and there were also animals there, as I recall, with a six-limbed body-plan like most Eden animals), but there the similarity ended. Can’t think of anything else. As I’ve said elsewhere, I think the initial idea for my sunless planet came from staring at the screen of my old Amstrad computer, with its glowing green letters on a black field! Hi Chris! I was wondering if there will ever be an American release of Daughter of Eden? I have the first two and love their covers and would love to have the whole set. At the moment, no American release is planned, I’m afraid. I hope that will change! I agree about the US covers. 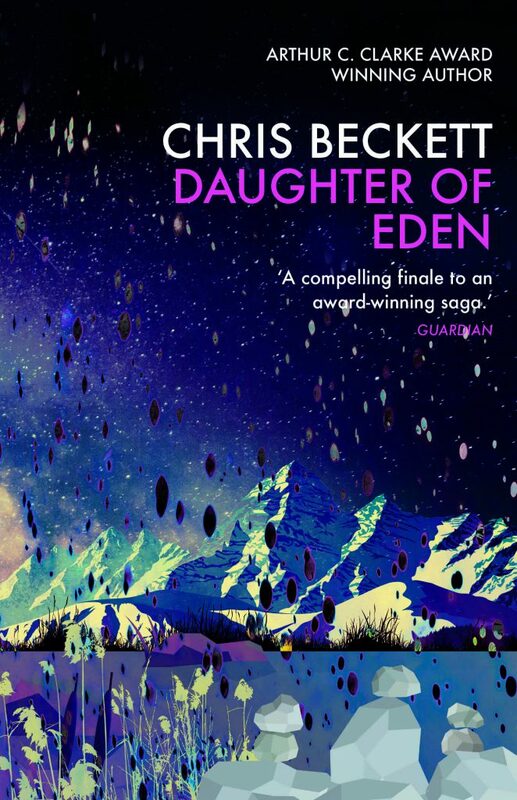 In meantime, I hope you can get hold of the UK edition of Daughter of Eden, as I’d be sorry if you missed it. In some ways, it’s my favourite book of the three. The UK version made it to my public library here in the States. I thought the first two books were quite good, though certainly not cheerful reading. Very thought-provoking, which is the hallmark of good fiction, especially good sf. Daughter of Eden noses out the other two for overall quality–I’m envious of the fine writing. The handling of the religious experience was honest and particularly sensitive, and as a person of faith, I appreciated that. While I certainly would read another Eden book, I also appreciate that an author must explore new territory. I will keep alert for your next works. Thankyou so much Todd. Daughter of Eden is particularly special to me personally, and it means a lot to me when others are able to connect with it. Much appreciate you taking the trouble to write. And thanks for your comments about my treatment of faith, which is obviously an important theme in all three Eden books. I wonder what you’ll make of America City. Eden is set in a place I know better than anyone else, but America City is set somewhere that many millions of people, including you, know much better than I do! Today I finished listening to all three Eden audiobooks back to back, primarily on my commute but also at work when I thought nobody was looking (I’m a microbiologist and while what we do is often fascinating, lab work can get a bit monotonous). What a fantastic two weeks! I was entirely captivated by Dark Eden and it was hard to stop listening, the three narrators did a great job bringing the story to life. As Todd says above, the three books were definitely thought provoking and I found the reaction of the characters to their rapidly changing circumstances entirely believable. I’m sometimes guilty of being overly dismissive of world-views that aren’t evidence based and I enjoyed having that challenged, particularly in Daughter of Eden. I hope that one day you have the urge to revisit Dark Eden, but for now I’ll start on America City. After all, how can we move forward if we just wait around for something that may never come! Thankyou Liam. Very kind of you to write. Writing is a very solitary activity so it’s lovely when readers get back to me like this, and reassure me that I’m not just talking to myself! So pleased you enjoyed the books. Hope you enjoy America City too. If you like short stories, Spring Tide is actually my most recent book. A new novel is in the pipeline. I have just finished Dark Eden and Mother of Eden (in their french translation) and want to thank you for these fantastic books. I can’t wait to read the third, do you know when the french version will be published? I would prefer to read your original version but I’m afraid my english is too poor. I would like to read America City too, is there a french edition? Thank you again for this visit of Dark Eden. Thanks very much Fanny. I’m very pleased you enjoyed them. I’m afraid I do not know of any plans as yet for French publication of Daughter of Eden and America City. I would love there to be French editions, but it is a matter of waiting for a French publisher to take them on. Thanks again, Fanny, and best wishes. I just finished reading Daughter of Eden & I hope for continuation of the series eventually. Based on the the New Earthers. They have the most potential to succeed. And maybe Earth returning to colonize. To help the genetic pool. Depends what we mean by succeed, I suppose, Clayton.